The teams of the Florence’s Calcio Storico (Blues, Whites, Greens and Reds) have faced off over the last two weeks in the semi-finals to decide which two teams compete in the traditional Tournament of St. John in Florence’s Piazza Santa Croce on June 24. The soccer game played in costume is one of Florence’s main events historically planned for the month of June in the celebrations for San Giovanni, St. John, patron saint for the city. For this special occasion, the large, beautiful square in front of the Church of Santa Croce serves as the playing field. Bleachers are set up for spectators and the stone square is covered with sand. For the final match, the Reds will face off the Blues on Wednesday June 24 at 5 p.m.
About an hour before the start of the game, the Historical Pageant will start in Piazza Santa Maria Novella and cross through the main streets of Florence’s center until it arrives in Piazza Santa Croce. The website for the city of Florence indicates tickets can be purchased at the Box Office located in via Alamanni 39, with tickets that go from 15 to 40 euro + presale fees (which I don’t think is exactly cheap). Tickets for the final game will be sold up to a few minutes before the start of the game. You can buy tickets directly in Piazza Santa Croce or, also on the day of the game, at the Teatro Verdi located on Via Ghibellina, about a block north from the square. The calcio storico is a very “physical” game where the calcianti (literally translated as “kickers” – yep, that is what they are called) play quite violently on the field. 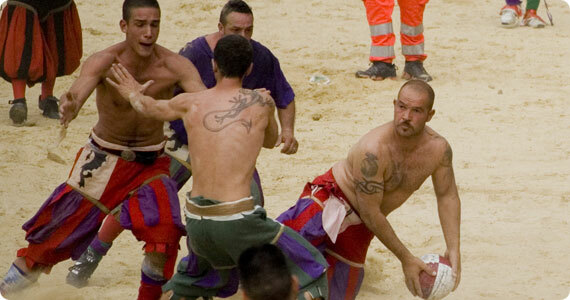 The Calcio Fiorentino was an early form of soccer (football) that originated in the 16th century. The official rules of calcio were published for the first time in 1580 by Giovanni de’ Bardi, a Florentine count. Just like Roman harpastum, it was played in teams of 27, using both feet and hands. Goals could be scored by throwing the ball over a designated spot on the perimeter of the field. The playing field is a giant sand pit with a goal running the width of each end. There is a main referee, six linesmen and a field master. Each game is played out for 50 minutes with the winner being the team with the most points or “cacce“. Originally, the game was played only by rich aristocrats who played every night between Epiphany and Lent. In the Vatican, even Popes such as Clement VII, Leo XI and Urban VIII are said to have enjoyed the game. The last few years, however, the game has come under attack because many deem the matches too violent. In 2006, the final match was actually interrupted because of fights that broke out on the playing field. The entire edition for 2007 was canceled as punishment for their behavior. We hope that in the future the game can continue to be played in the best of spirits. The first two games this year have gone well from this point of view. The Calcio Storico is in the end part of the celebrations for the city’s patron saint and as such, aside from the competitive nature of the sport, should continue to be a fun and entertaining way for all of us to continue a centuries-old tradition of celebrating on June 24. So if you are in Florence this Wednesday and have nothing else to do, consider heading towards Piazza Santa Croce and seeing if you can get a last-minute ticket to attend one of Florence’s most popular annual events! Remember the fireworks display from Piazzale Michelangelo that same night, best seen from the lungarno.